McGuire’s recently participated in a humanitarian mission to Ecuador with Long Island-based “Blanca’s House,” a not-for-profit organization dedicated to providing donated healthcare services to international children in need. Mary Bohr, an audiologist with McGuire’s, returned in early June from Ecuador, where she joined a team of medical professionals who traveled to Babahoyo, Ecuador, to offer medical services. 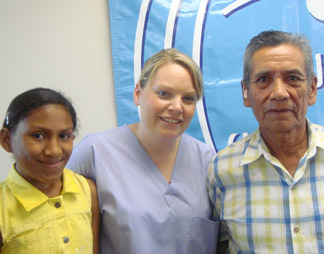 Mary provided audiological services and hearing devices to those who required her assistance. In all, Mary tested 45 patients and fit 33 hearing devices. Patients ranged in age from just under 2 to 86 years. One mother traveled more than 12 hours by bus so that her young daughter could be fit with a hearing device. “The experience was unlike any other I’ve ever had,” Mary said. “It was very gratifying to see these people of very modest means show their thanks for us restoring or advancing their hearing health,” she added. Mary described the challenging conditions experienced during the mission, ranging from a temporary power loss to a virus she had contracted during her stay. “I was fitting patients with hearing devices while I had an IV in my hand,” she recalled. This is McGuires’ first mission with Blanca’s House, and this mission was sponsored by the Foundation for Sight and Sound, a Long Island-based not for profit organization (www.foundationforsightandsound.com). The Foundation donated more than $80,000 to purchase the needed hearing devices and equipment for the mission. "A real miracle happened! I went into Mcguires in Riverhead and my most favorite person, Mary Boh, in the universe told me that it’s time ..."
"When I was 40 and needed glasses, I got them without a second thought. Now in my 70s with some loss of hearing, I recognized that I had to t..."
"Sandra could not be more helpful. Excellent service." "Awesome Michael was the nicest most helpful person we could have ever worked with. Thanks so much for making our vacation more beautiful for..."